20/20 Vision Isn't everything-Vision is critical to learning! - What is Seeing Double or Double Vision? -Relief from Frequent or Chronic Headaches, Visual Stress, Eyestrain, and/or Stomachaches during or after Reading, School or Office Work. 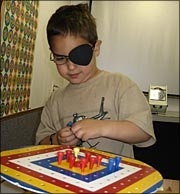 To read definitions of Vision Therapy by outside sources, see What is Vision Therapy? and/or Vision Therapy? Self-help Eye Exercises?. To browse through hundreds of stories writtten by parents, teachers, adults and children, go to a national of catalog of Vision Therapy Success Stories.